Whenever I find myself in a reading rut–when I have picked up and put down several books without getting drawn in, when I am going through a stressful or unusual time and I need something to sink into that isn’t too taxing or difficult–I go looking for a particular kind of book that rarely lets me down: the food memoir. Despite having a notoriously picky palate, I cannot get enough reading or watching narratives focused on food. Back when I had cable, I spent many a marathon evening on the couch binge watching Top Chef or the Food Network. And when I was pregnant with my first child and feeling very impatient during those last few weeks, I sat in a chair by the window and inhaled Ruth Reichl’s trilogy of food memoirs. There is something about reading someone’s life as remembered through the meals they ate or the food they cooked that really appeals to me. Because we all have that common, don’t we? Meals eaten alone in misery or shared with joy. What did your parents feed you when you were small? What’s the best meal you’ve ever eaten? What do you cook when someone needs comforting? Food is love and food is life, so there should be no surprise that some of the best writing I’ve read has centered on food. This is that one book about food and eating that you should make yourself read in your lifetime. You know the one–she’s writing about food and hunger, but she’s really talking about the human heart and our capacity to love. Each chapter is a vignette, if you will, about her experiences growing up, the effects of war, death, loss, starting over — many of the usual topics for a memoir, but all are interwoven with the meals she ate and the drinks she had. Fisher was so elegant and eloquent that you can’t help but imagine her sailing around among glamorous settings, impeccably dressed and impossibly cool, eating her way around the world. Her voice is wry and honest and super compelling. If you consider yourself a fan of both good writing and good food and happen to be interested in the cultural and social history of the early 20th century, MFK Fisher is a must read. 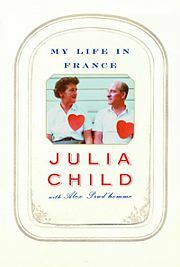 Everyone knows who Julia Child is by now, as they rightly should. Famous for her big, boisterous personality and her strides in cooking, many remember Child from her TV show. Her memoir, posthumously published by her grandnephew Alex Prud’homme, is tremendous, my friends. Brimming with fascinating details and exciting and drool worthy culinary adventures abroad, this book is equal parts cookbook and travel journal. Child writes honestly about being a big, awkward American among petit French fashion plates and about her experiences in the all male cooking classes she took. By the end of this lovely story, you will be completely aboard Team Julia. 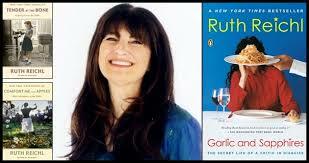 Ruth Reichl’s three memoirs take us from her childhood to her wildly successful career as a restaurant critic. She talks about how food, what and how people choose to eat ,can tell you everything you need to know about them. By turns informative and incredibly personal, Reichl writes entertainingly about growing up with a very eccentric mother who was known to scrape mold off the top of a dish and feed it to her children; about the early days of the organic food movement in Berkeley, California; about traveling the world and learning to cook and eat; about the personal heartbreaks of trying to start a family, of her transition from chef to critic; and about the hilarious disguises she would wear to try and experience a restaurant incognito. All three books are warm hearted, comforting reads. And do they not have the *best* titles ever? Long before I knew who Ruth Reichl was, I wanted to read a book called Comfort me with Apples. 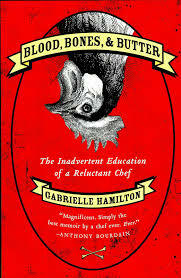 Chef and restaurant owner Hamilton writes about her unconventional life in this impressively readable memoir. For me, the memoirs I enjoy the most are written by people who I would like to spend time with, people with interesting stories, who I never want to stop talking. Hamilton has a noteworthy voice and very strong opinions. She makes interesting choices in her life including some that I don’t quite understand or agree with. Still, I wanted to hear her explain those stories and I never lost interest, even when her narrative veers off in a direction I didn’t expect it to. The appeal of this memoir is not so much in the food as it is in the artist creating the food. Anthony Bourdain called this book the best memoir he’s ever read and, coming from him, that is quite a compliment! Previous Post Don’t overlook the noble audiobook! Enliven the mundane aspects of your life with a good listen. Next Post Four Great Books about Mothers — Being one, Having one, etc.